It is replaced by the Datalogic Memor. The new Falcon PT40 is a very compact, sleek portable data collection terminal, sized to fit in your shirt pocket or on your belt clip like a cell phone. Complete with integrated barcode laser and multiple memory options, the Falcon PT40 is powerful enough to handle most any batch data collection task. The Falcon PT40 is designed primarily for retail and light industrial applications where low cost and an extremely small form factor are desired. 2MB RAM, batch, 26 keys, monochrome display. 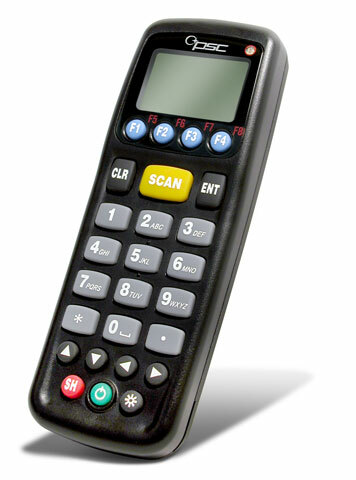 Includes standard range scanner. Order cradle, power supply, line cord, cables, & battery separately. See accessories. Includes everything you need: Falcon PT40 terminal (Falcon PT40, 2MB RAM, batch, 26 keys, monochrome display. Includes standard range scanner. Order cradle, power supply, line cord, cables, & battery separately. See accessories. ), charging/communications cradle, serial cable, US power supply, AC line cord and battery. Includes everything you need: Falcon PT40 terminal (Falcon PT40, 256KB RAM, batch, 26 keys, monochrome display. Includes standard range scanner. Order cradle, power supply, line cord, cables, & battery separately. See accessories. ), charging/communications cradle, serial cable, US power supply, AC line cord and battery. 256KB RAM, batch, 26 keys, monochrome display. Includes standard range scanner. Order cradle, power supply, line cord, cables, & battery separately. See accessories. Lithium-ion battery for Falcon PT40. Single slot cradle. Includes serial cable. Order power supply separately, please see accessories.